All during Victoria's long reign the streets of London (not to mention those of the other industrial centres) teemed with the homeless. Both philanthropy and government services were frequently overwhelmed by the sheer numbers of the needy. Following the Poor Law Amendment Act of 1834, a uniform public strategy for helping the poor, based on the development of workhouses, emerged but the primary aim of the act was to reduce the poor rates. This was to be accomplished by making the conditions in the workhouses so harsh that the poor would be dissuaded from applying for relief. This was done by largely adhering to a policy of providing a living standard below that of the poorest labourer. The grudging benefits of the workhouse system were to be available to those who lived in the Parish. As a result, no aid was available to those who might need very short term help, beggars, tramps, wayfarers and what Victorians referred to as "casuals" or "vagabonds." By 1837, however, it was apparent that something needed to be done to provide assistance, particularly for those indigent wayfarers from other parishes. The Poor Law Commissioners recommended that this should be provided as short term shelter (usually for a single night) and a meal in return for work. 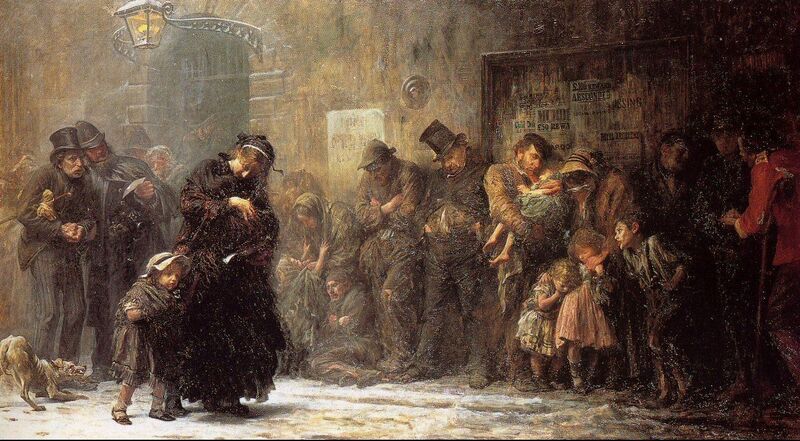 In addition to the wayfarers, there were those local, urban homeless who were unwilling to go into the workhouse. This might have been because they valued their freedom or, more probably because conditions in the workhouse were seen as being more onerous than being on the street or even in gaol. Rather than claim workhouse relief they might take a night's accommodation in a casual ward in order to avoid foul weather or to get the meagre supper that was provided. Those who sought such short term accommodation were separated from the longer term residents of the workhouse confined to the "casual" wards. According to Norman Longmate, the "standard policy" which was developed to deal with such short term applicants was "to make the vagrant's life so disagreeable that he would hesitate to come back." After queuing, sometimes for hours, and if there was space available, a casual might be admitted through the single entrance near which were the casual wards. A casual ward might consist of a large room with some bedding and a bucket for sanitation. The bedding was often nothing but straw, with rags for coverings as in the Richmond workhouse in the 1840s. In return for this largesse, the occupant was required to do a set amount of work before leaving on the following day. Often this work was soul-destroying. Men might have to spend hours breaking stones while women were set to picking oakum. Conditions in the casual wards were deliberately designed to discourage vagrants, who were considered potential trouble-makers and probably disease-ridden. every vagrant was searched and bathed, but in the cold season of the year the bathing is discontinued; neither are they searched unless there are grounds for suspecting that they have property secreted upon them. Men and women were then sent to separate wards where there were two large inclined boards or "guard-beds" on either side of a large room and with a passage down the middle, between these sleeping arrangements. "The boards are strewn with straw, so that, on entering the place in the day-time, it has the appearance of a well-kept stable." In the morning the casuals were given another meal of bread and cheese and allowed to go on their way. In some instances they were required to work for three hours to "pay" for their accommodation and the two scant meals with which they were provided. As Mayhew points out, "the work was demanded as a test of destitution and industry, and not as a matter of compensation." Between 1845 and 1848, the number of those who, on average, spent a night in a Casual Ward grew from 1,791 in England and Wales to 16,086. The system, which, by any ordinary standard, was tight enough, was tightened even further in 1848 when the President of the Poor Law Board instructed the officers who administered the law to restrict admissions to a far greater degree than had been the case previously. That this was effective can be seen from the numbers admitted to the Casual Wards in Wandworth and Clapham where from a high of 14,675 admissions in 1848, the number declined to 3,900 in 1849. For Metropolitan London, between 1847-48 and 1848-49, the number relieved fell by almost fifty per cent! In the half-century following Mayhew's investigation things did not improve much, if at all. Of course, in addition to the Casual Wards which were operated under the Poor Law Board, there were night refuges. According to Blanchard Jerrold, in London: A Pilgrimage, published in 1872, bread was distributed to those fortunate enough to gain admission. Before going to the sleeping dormitories, the vagabonds were required to bathe and this was, for many, an ordeal because of their poor physical condition and poor health. Once they had bathed they went to "the dormitories set out like barracks, and warmed with a stove." Here there might be a Bible reader walking up and down reading aloud. Women and children stayed in a separate ward from that of the men. Possibly this was a kinder, gentler environment than that of the Poor Law Casual Wards but when one considers the Casual Ward system as described by General William Booth, in 1890, It is easy to see that the notion of what public social welfare for indigent vagabonds should consist of had changed very little over the half-century. The theory of the system is this, that individuals casually poor and out of work, being destitute and without shelter, may upon application receive shelter for the night, supper, and a breakfast, and in return for this, shall perform a task of work, not necessarily in repayment for the relief received, but simply as a test of their willingness to work for their living. The work given is the same as that given to felons in jail, oakum-picking and stone-breaking. the applicant for admission to the casual ward must be destitute, and as he is subjected to a rigorous search, he must really be destitute ; and fourpence, much less four shillings, is sufficient affluence to disqualify him. At the Whitechapel Workhouse, at just after five in the late afternoon, London found "a long and melancholy line ... which strung out around the corner of the building and out of sight." "It was," he said, "a most woeful picture, men and women waiting in the cold gray end of the day for a puper's shelter." One of the most telling descriptions of what it was like to spend a night as a Casual was published in the Pall Mall Gazette in 1866. James Greenwood and a friend entered Lambeth workhouse for a night in January 1866 where they they remained until the following morning. To download a copy of Greenwood's account, click here.